Pssst...Hungry Girl feature free inside! 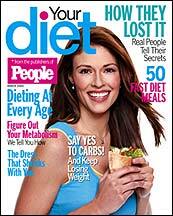 The New YOUR DIET Hits Stands Today! The new issue of the world's coolest diet mag hits stands today. Issue number 3 of Your Diet has finally arrived. You remember this mag, people. It's from the people who bring us People Magazine. (Ok, we're through saying "people.") This latest issue is packed with recipes, inspiring stories, gorgeous photos, and even has a two page feature on Guilt-Free Snacking written by Hungry Girl herself. Weeeee! Your Diet isn't on a set publishing schedule yet so we're not sure when the next issue will come out. But this new one is out NOW. Don't miss it! Kellogg's Healthy Beginnings Gets Healthier! The Kellogg Company is teaming up with Kroger, ShopRite, Publix, and Wal-Mart and bringing us a really cool thing called Healthy Beginnings Health Check Program events. During these events, you'll be able to go into one of the participating stores above and test your cholesterol, check your blood pressure, and have a BMI screening. In addition, you'll receive a health kit with valuable info and food coupons for Healthy Beginnings cereals. Can't wait to have Tony the Tiger test our cholesterol and tell us it's Grrr-eat! A few weeks ago we talked about the soon-to-be-hitting-the-shelves cholesterol-lowering tortilla chips. Well, in the "already-on-the-shelves" department is Yoplait's Healthy Heart line. The low-fat, sugar-sweetened yogurt contains plant sterol extracts which have been known to lower LDL ("bad" cholesterol). The new yogurt tastes the same as Yoplait's regular yogurt, and has 180 calories and 1.5g of fat per serving. FYI, that's about 80 calories more than Yoplait Light. ***A new study suggests that families that have meals together are happier and healthier, and less likely to suffer from depression. ***Cereal Vitamins? Yep, General Mills is launching Wheaties and Total multivitamins, as an extension on their cereal brands. ***Showtime's newest series, Fat Actress, starring Kirstie Alley, debuts tonight. If you watch, email us tomorrow and let us know what you think. That's all we've got... HG Out! Today, March 7th, is National Crown Roast of Pork Day. A crown roast is formed by joining two center rib roasts in a circle with the bony rib ends standing up, like the points of a crown. Fancy! Share this news with people you like a lot. Click "send to a friend" NOW!